Hey guys, Arnett here! 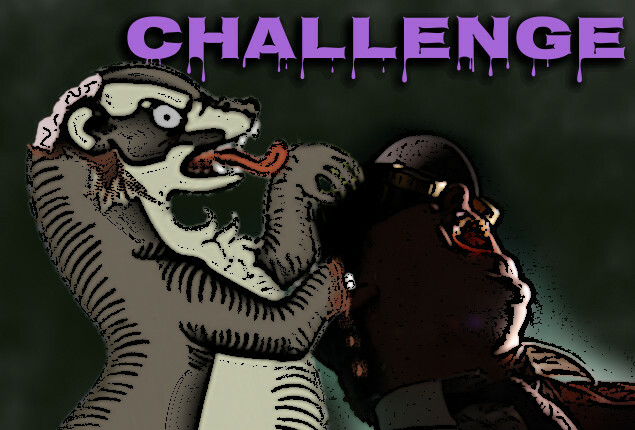 My first fiction challenge was a bust. My second one was a BLAST! Well... let's flip the coin once more. Lucas had a great idea of filling the site with Halloween themed stories in honor of October. I think it's a great idea. So why don't we crack our writing fingers and begin the process of MORE STORIES!!! A horrible virus, a scary shadow, a crazed murderer, a cursed comb.... Antiford has a darker side that we have managed to see in many of the stories in the Library. However, we are capable of truly scaring the lights out of anyone. Time to take the creepy writings from our Kuuvian hunter and our Vibranni mercenary. There are horrors out there that our characters can find. Let's at least do some flash fiction, but if you have a story that needs more to tell, then go ahead. This is a time for some creepy writings. Legends, curses, creatures and cryptids. These do not have to be canon, and many of them won't be (think Simpson's Treehouse of Horrors). Like the last flash fiction challenge, post the links to your stories here (in the comments below) and We'll do our best to keep up with a current list of the stories written because of this post. Lucas M Buford is already planning a few stories that won't abide by the 500 word limit, but will still be awesome. Stories under the limit are eligible to be made by Abigail into tiny books. If you need some help with story ideas, or anything of the sort, let me or Buford know. An urban legend, a spooky campfire tale, all can enhance the world around us. I hope you have a fun time writing and I encourage us all to read the works others work hard on. Let's have some fun!